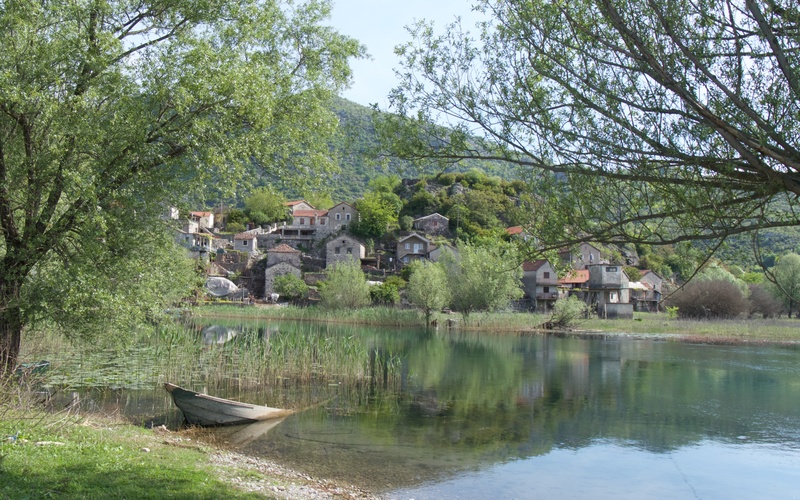 On the last day of April, I head to the north side of Lake Skadar between Podgorica and Cetinje and the lakeside village of Dodoši. The hills are south facing and the vegetation less lush than on the opposite side; the plants here are also more advanced with wild sage (Salvia officinalis) flowering as well as tall spikes of yellow flowering, great mullein (Verbascum thapsus). 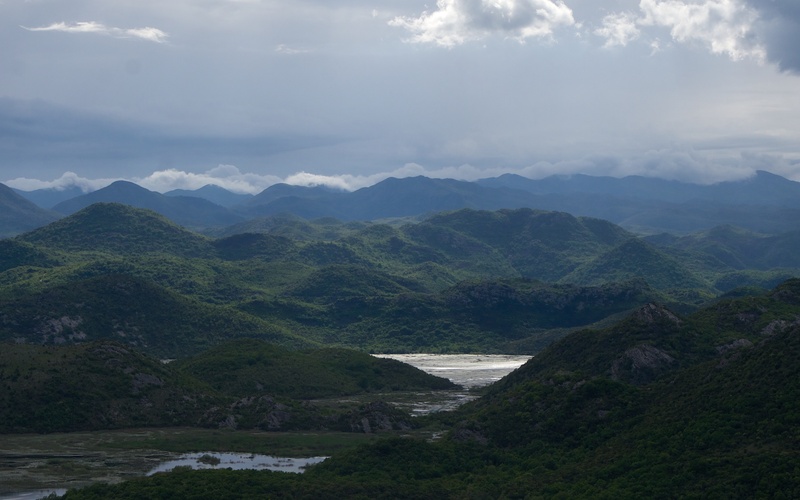 Looking south over Lake Skadar across endless hornbeam and oak-clad hills with Lovćen mountain somewhere in the cloud. At a small war memorial, I stop to have a look. A small area of limestone pavement behind the litter-strewn parking area holds a colony of Bertoloni’s orchid (Ophrys bertoloni), one of the loveliest Ophrys species. The pollinators are two genera of solitary bees attracted to the dark velvet and metallic blue surface of the petal. The pleasure was short-lived because two dogs, one puppy and an older, smaller bag of fur were lingering and seeking attention. They appear recently abandoned being well fed and soppy friendly but without an owner or nearby house in sight. I drive away in the bright sunshine thinking on the misery of men. 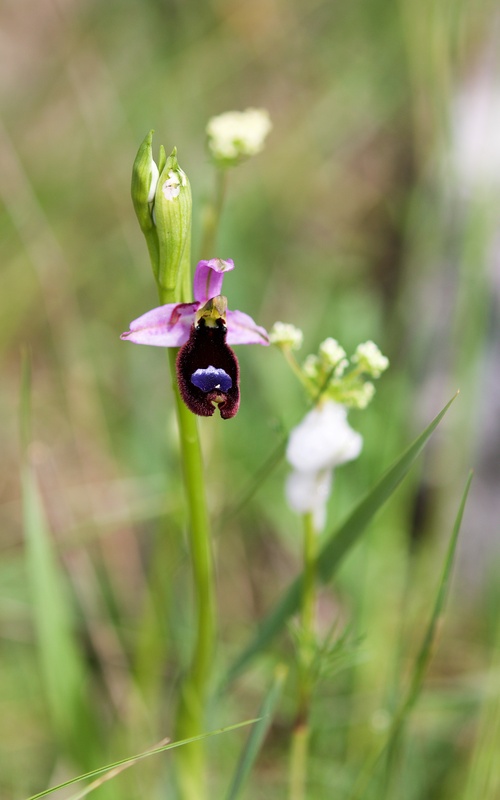 Part of a small colony of Ophrys bertoloni. 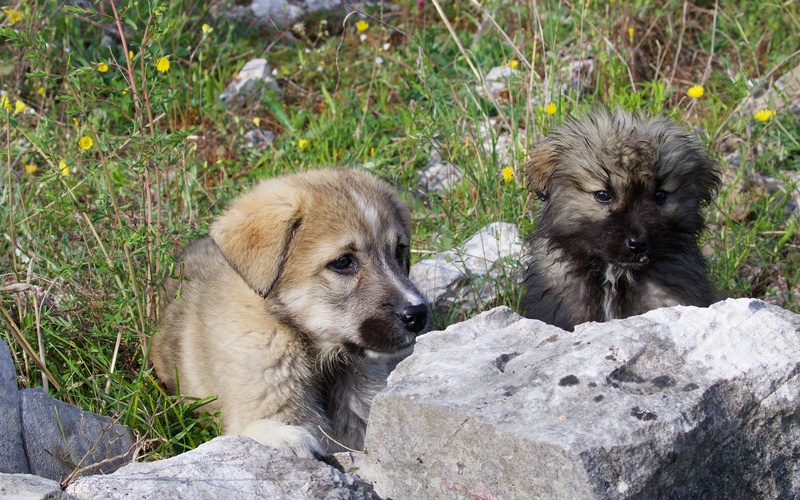 Two dogs, both probably abandoned by their keeper. 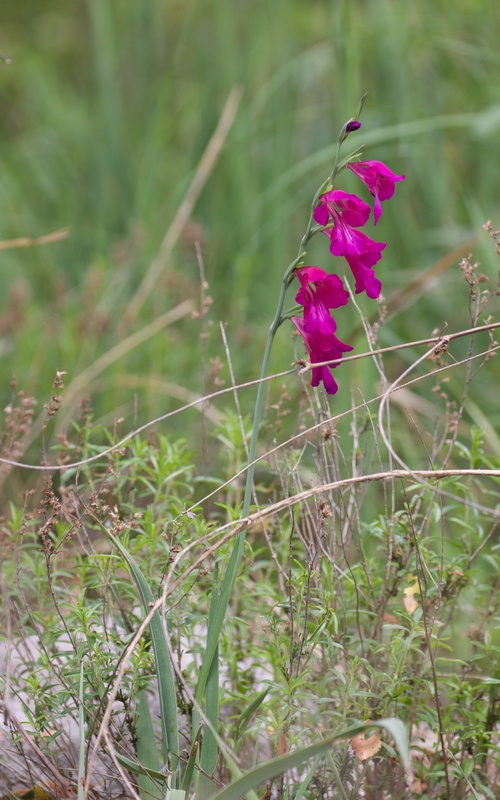 Further along the narrow road, wild gladiolius (Gladiolus illyricus) is commonplace in the rocky terrain. 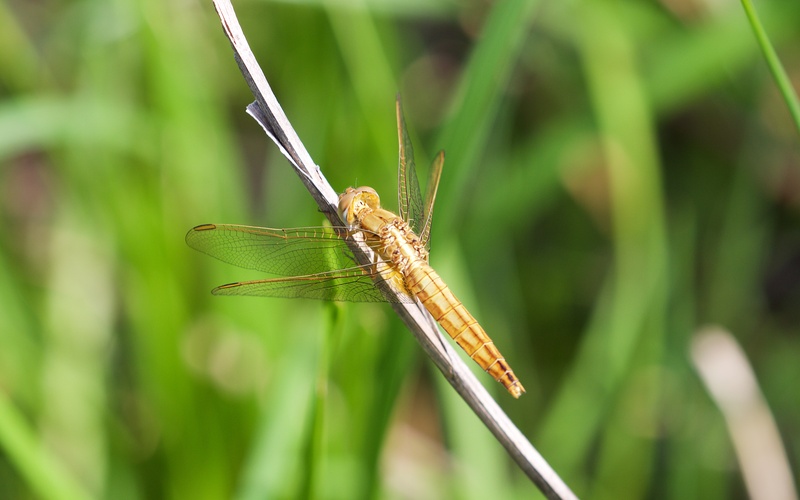 These elegant plants are easily overlooked when hidden alongside tall grasses, attractive clumps of blue flowering sage, bright yellow vetches, crucifers and hawkweeds. 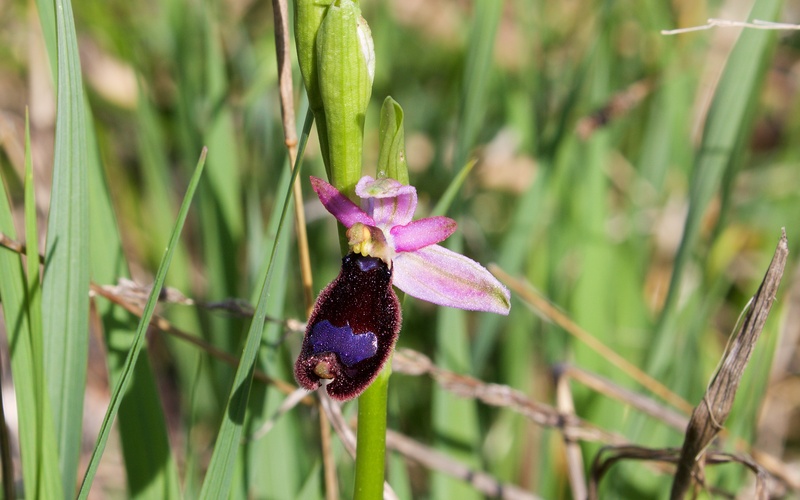 The oddest plant on the roadside is an Ophrys species that appears to have a flower with no petals just the sepals or is there more to come? 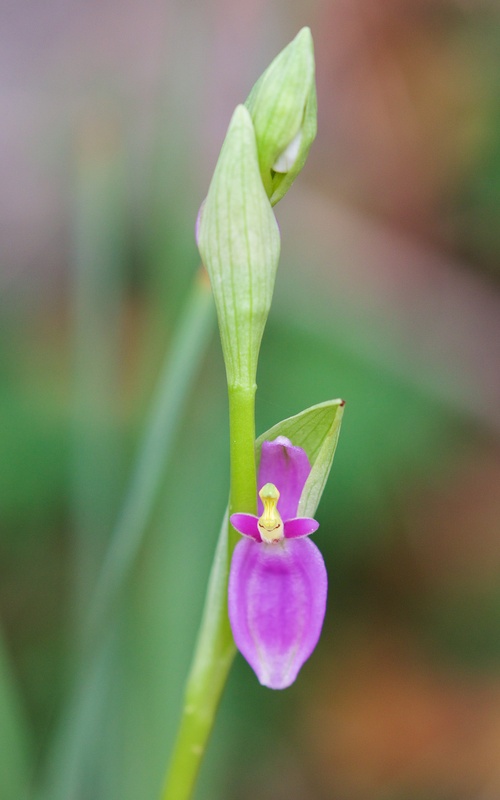 Elegant wild gladiolus and a single, strange Ophrys flower. 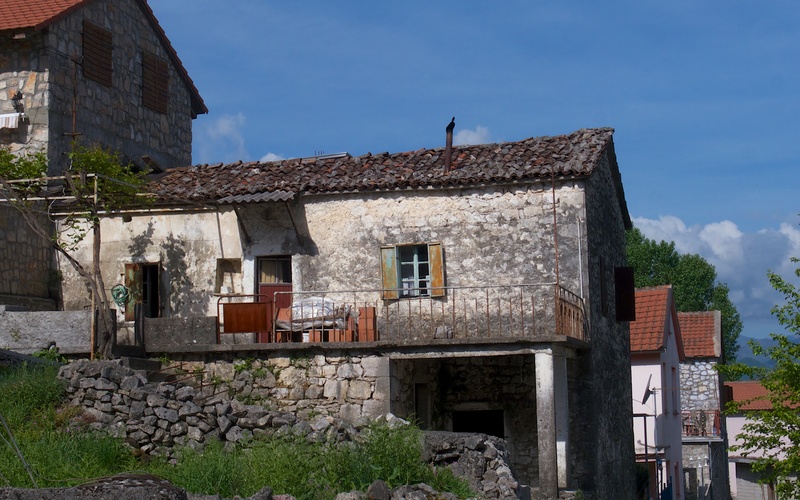 The road winds down the hill to the village of Dodoši, which is small and compact and adjacent to a waterway. Given its isolation, the development of tourist facilities is negligible. There is one village shop with limited supplies. Men here fish and families grow crops, nothing more. An old restaurant on stilts by the river appears abandoned but it may be resurrected for the main summer season. Men fish with rods and a bucket for pleasure from the bridge over the river and the water teems with tiddlers swimming against the current at the surface. The waterside town of Dodoši. In one of the terraces below the house, I found European birthwort (Aristolochia clematitis), one of two food plants of the southern festoon butterfly (Zerynthia polyxena) larva. This plant, unlike round-leaved birthwort (A. rotunda), grows on drier ground and is a common weed of arable crops in the Balkans. 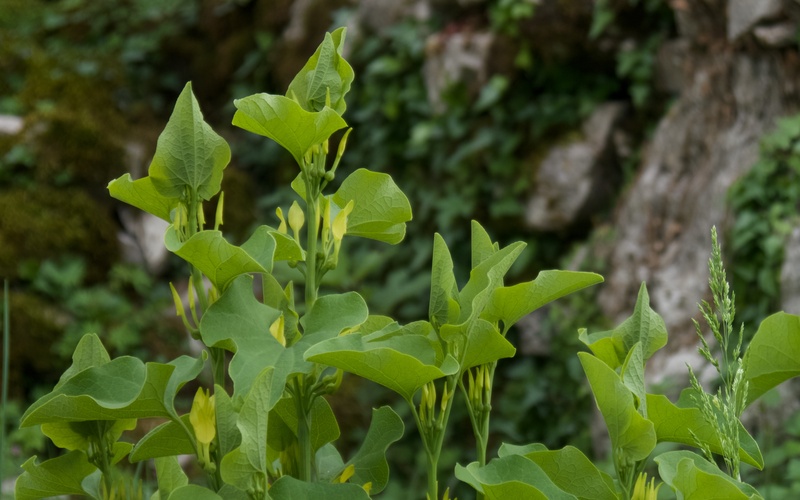 The aristolochic acids found in all Aristolochia species, both the plant and seeds, are highly toxic to humans causing chronic kidney failure and urinary tract cancers. The butterfly uses the chemicals as a defence from predators and hence the bright and colourful design. 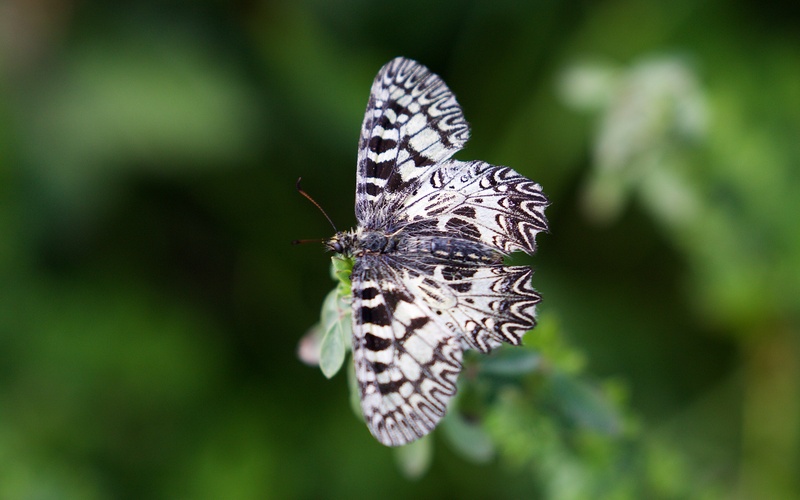 Southern festoon butterfly; its larvae feed on Aristolochia clematitis and A. rotunda. 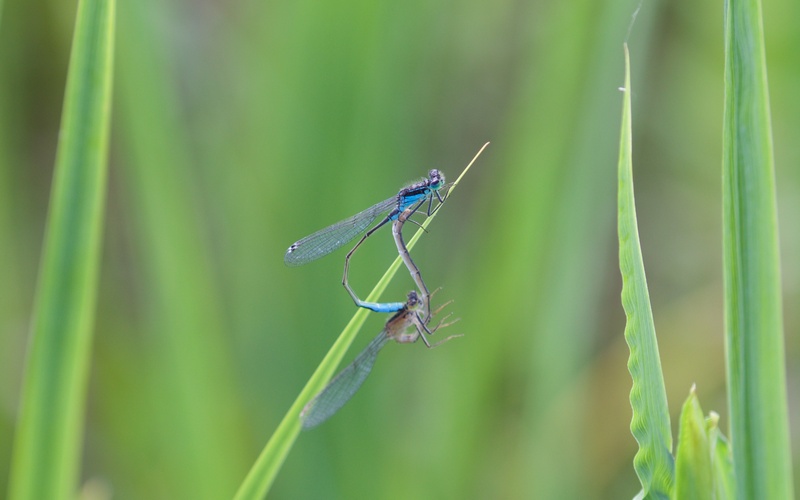 Aristolochic acid ingestion has killed and seriously affected many tens of thousands of people, principally in rural areas around the tributaries of the Danube delta. The illness was bad enough to be given a name: Balkan endemic nephropathy (BEN). Research identified that Aristolochia clematitis seeds mixed within bread flour was the probable cause of the discrete pockets of illness back in the 1950s but was overlooked until recently and other causes were pursued. One of the confusing factors was that the dosages received were small so took decades for the illnesses to manifest themselves. Birthwort species have also been used in Chinese herbal medicines and affected many people in the same way; since concentrations within preparations were much higher, illnesses arose after only months of use. European birthwort: the accidental cause of painful deaths and chronic illnesses in the Balkans. The weather turns and light rain forces me back as I begin the walk across the water meadows on the path round the promontory to Žabljak Crnojevića only just over 3km away. 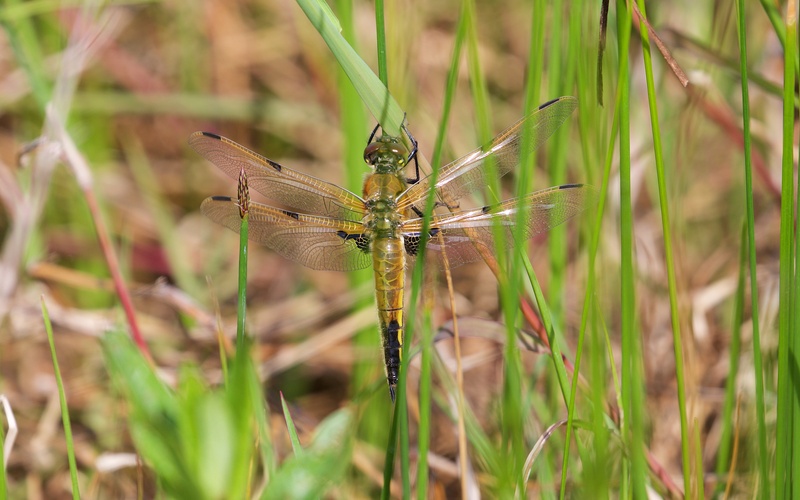 I come back the next day in much better weather to make the walk; the trackway through the meadows, just passable with a few flooded areas of low ground, is full of dragon and damselflies. 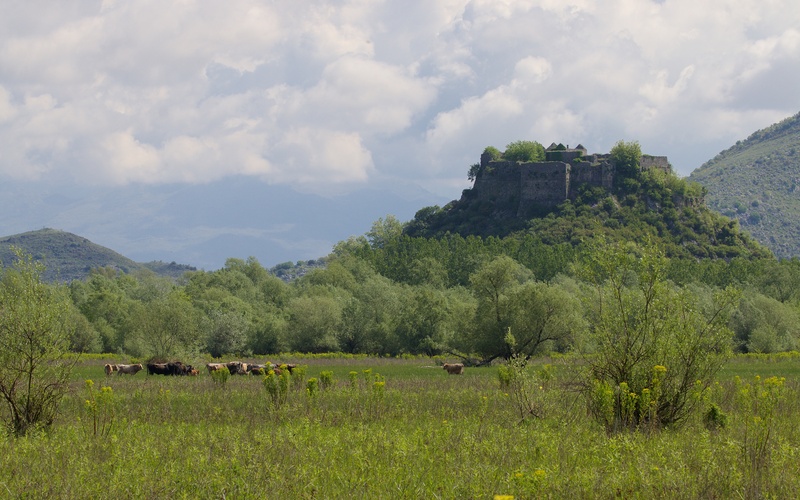 Water meadows with cattle herd, including some fine looking bulls, beneath the the old fortified town of Žabljak Crnojevića. 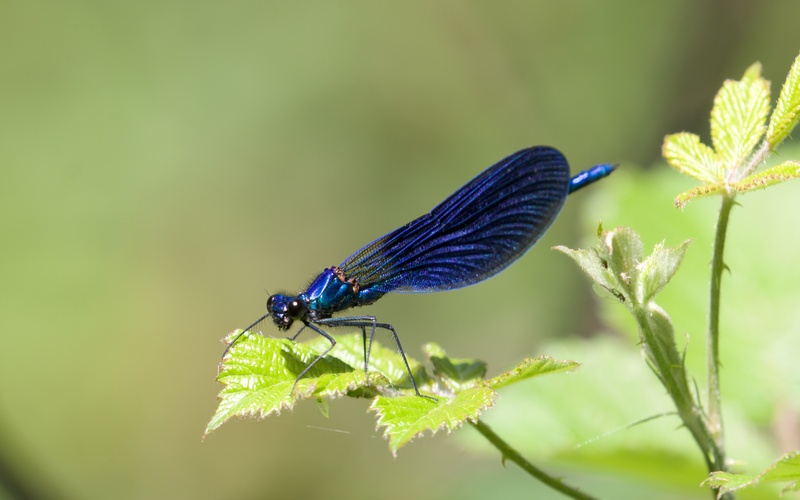 One of many beautiful demoiselle males by the riverside, I could see no females. 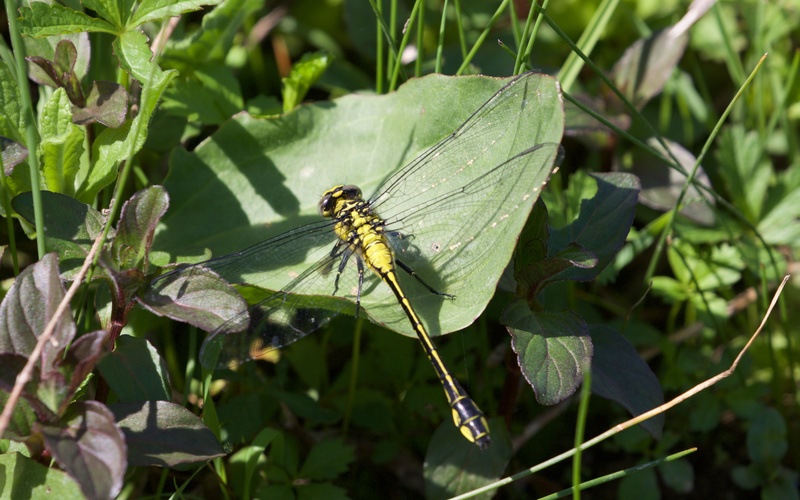 Common clubtail female (Gomphus vulgatissimus). The weather is hot, a herd of quarrelsome cattle including some fine-looking bulls lie between me and the old hill fort so I turn for home and leave them to it. I cut across country and follow the river back to Dodoši disturbing a sneaky cuckoo looking for nests. Two small boats with their small engines at full throttle run up the river creating waves along the shore. Back in the village, the bridge is now crowded with young men, each trying to catch more fish than the rest. Locals on their terraces overlooking the river, eat, drink, talk and laugh loudly. May Day is a sunny holiday.